The document was signed by Dr Raniero Guerra, Director-General for Health Prevention, Ministry of Health of Italy, on behalf of Minister of Health Ms Beatrice Lorenzin; WHO Regional Director for Europe Dr Zsuzsanna Jakab; and WHO Director-General Dr Tedros Adhanom Ghebreyesus. 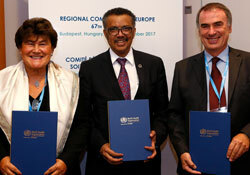 The signing took place alongside the 67th session of the WHO Regional Committee for Europe in Budapest, Hungary. The CCS presents both past and present collaborations and achievements of Italy and WHO. It provides a framework for future collaboration within the context of the 2030 Agenda for Sustainable Development, across the 3 levels of WHO and across sectors in Italy. It is fully aligned with the European health policy framework Health 2020, and with WHO’s Twelfth General Programme of Work. Additionally, it builds on the joint report from a 2013 mission of the Ministry of Health of Italy, the Regional Health Authority of Sicily and WHO/Europe, which assessed health system capacity to manage sudden large influxes of migrants. strengthening the role of Italy as a donor country in global health through the WHO global programmes and through enhanced collaboration between WHO and Italy in the Italian Development Cooperation Agency (AICS) priority countries. The CCS was shaped through a series of consultations with representatives from all levels of WHO, the Government of Italy and scientific institutions.